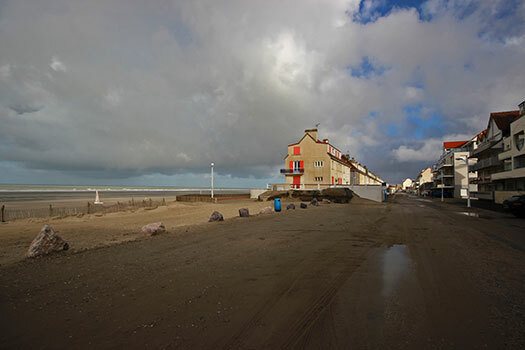 StP Fort Mahon Plage H.K.B., K.V.A D2. 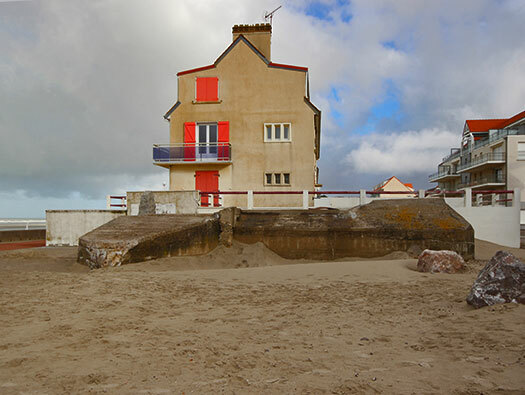 StP Fort Mahon Plage H.K.B. 3 x 10.5cm K.331(f) may have looked something like this. Starting point at the north end of the beach and working south. A plane of where I think all the bunkers may have been. The R640 on beach, I am not too sure which way it faced. One was in an open emplacement. Batterie 9./H.K.A.R.1245 4 x 10.5cm K331(f) guns. H.K.B. 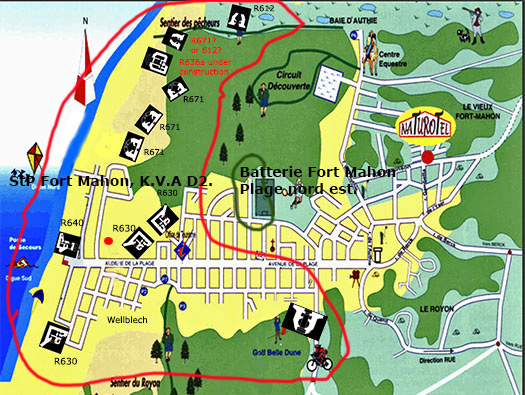 - Heers Kusten batterie. H.K.A.R - Heers Kusten Artillery Batterie. Here two R671 casemates with 10.5cm guns fitted on a pivot. There is a third buried in the sand behind where I am standing. But as usual I completely missed it. The casemates from the car park. Casemate for a pivot mounted 10.5cm K331(f) gun. The gun a French towed artillery piece was mounted on pivot bolted to the floor of the casemate. Here the gun is on its pivot. The fourth gun would look like this its 10.5cm K331(f) on a its Lafette. 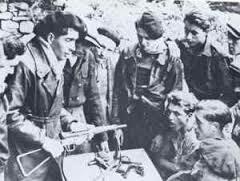 (f) means its a French gun. A very heavy mantle in front of the gun position. Paper cement bags would be screwed up and pushed into the concrete, and as it dried they were then pulled out to create a camouflage effect. The rear entrance where there should have been two heavy doors to close off the rear. 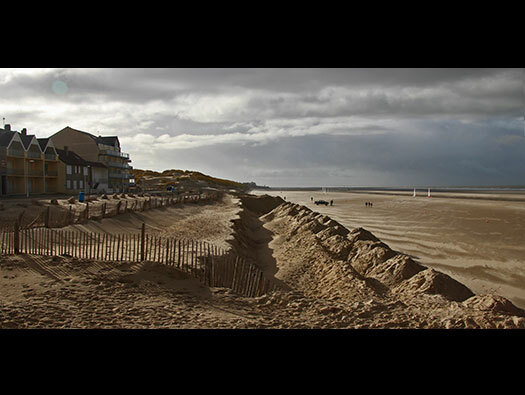 These often were not fitted before D-day came along. 494P2 doors that may have been used here? Looking out of the rear door. Hidden above in the dune. The path to the rear door. There are two niches, one would be for the shells and the other the brass case. Exhaust pipe to remove fumes from the gun room. This is the plan of an R669 showing how the extraction pipe were set into the concrete. Bunker of some sort, may be part of a search light shelter. Search light from an allied plan. 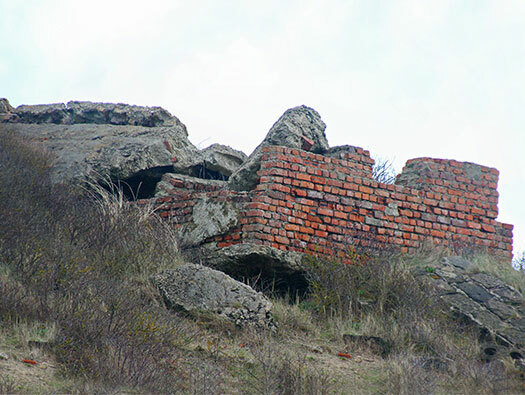 Two R630 bunkers covering the back of the village and may be built over. I think when we did see one from the road. R640 on the beach now removed. This looks like a Wellblech shelter. 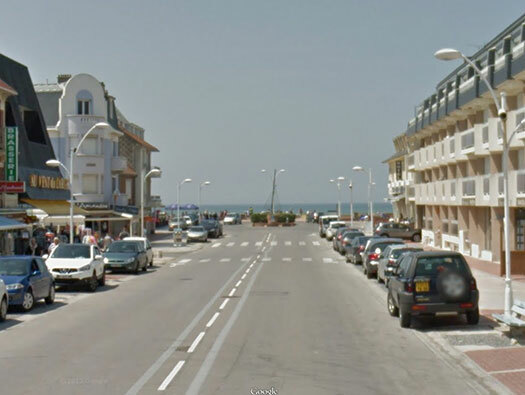 Set behind what is now a road running parallel to the sea. 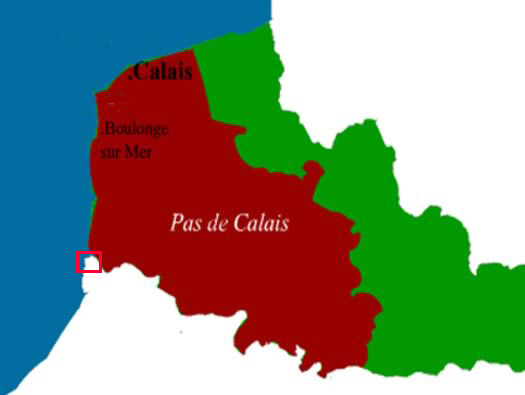 The position of the Wellblech. Another air photo of the area. These could be accommodation for the guns crews and the infantry defence. Inside a rather wet Wellblech in Brittany. An air photo of the Wellblech position. Here they have been removed off the beach and dumped. I have seen recent photos of several still in the sand dunes. At the end of this road and set on the promenades an R640 casemate for a 7.5cm Pak. I think this is the R640 that was on the beach. Plan of an R640 from an Allied drawn plan. Along the beach at the south end. I imagine this is the position of the R640 and it would shoot its 7.5cm Pak down the beach. Now the southern end of the beach. At the end of this row houses is the R630 a machine gun casemate with an armoured plate. The type of metal plate that would have been used to cover the embrasure. R630 looking into the embrasure with its flanking wall on the left side and a Tobruk defence.. Inside a crew room of a bunker. 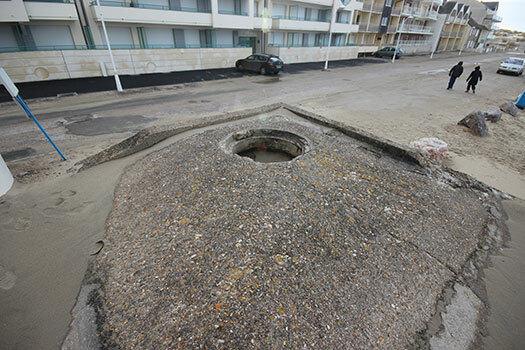 The Tobruk allows 360degree view around the bunker and can even be used as an anti-aircraft role. An allied plan of a Tobruk. This is a 1946 air photo of the R630 with no houses about. There are some memorials on the side of this bunker. A PLAQUE remembering five French soldiers who crossed the English Channel in canoes to join the British war effort has been unveiled at Beachy Head. The five young men from the French region of Picardie overcame the odds to traverse the 60-mile stretch of sea on September 16, 1941. 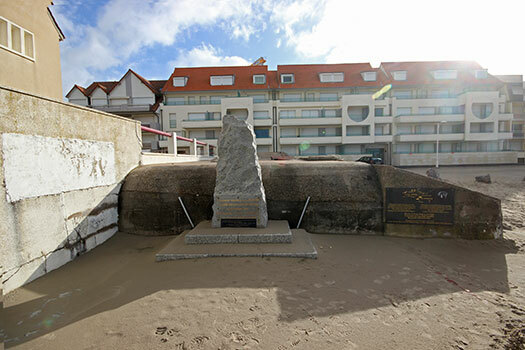 The brave soldiers, StP Fort Mahon Plage ..... g bas Reynold Lefebvre, Christian and Guy Richard, and Jean-Paul and Pierre Lavoix, were determined to flee occupied France to fight on with British troops. 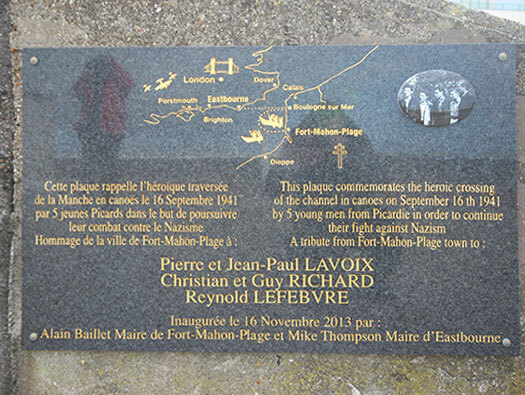 Now their heroic efforts have been officially recognised through a special plaque, commissioned by the town of Fort-Mahon Plage, close to where the men set off, and located at Beachy Head. The Mayors of Eastbourne, Cllr Mike Thompson, and of Fort-Mahon Plage, M Alain Baillet and Mme Yvette Bonnet, joined other dignitaries including Philippe Lavoix, the son of Pierre Lavoix, for the official unveiling. Two of the five men are still alive. Jean-Paul Lavoix, 88, who lives in Kerlouan (Brittany) broke his leg three months ago and was not able to attend the event while Guy Richard, 87, now lives in the South West of France. Eastbourne Herald news paper. Looking down the beach note the aerial fittings on the other-side of the fence. Aerial fitting inside a bunker.. The periscope was used to view a 360deg around the bunker and also to target the machine gun. Periscope poking out of its fitting. The view up the beach.